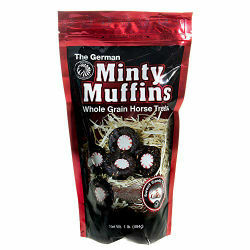 It's the German Horse Muffin with a sweet Brach's Star Brite mint in the center! Each muffin is a decadent blend of sweet feed and molasses plus corn, oats, bran, wheat flour, cornstarch, soybean meal, dehydrated alfalfa meal, vitamins and more. Brach's Star Brite mints are made with real Peppermint Oil.